Bridge Water Designs' postulation is that monochromatic homes can be uneventful if imagination has escaped the possibilities. When one steps into a room an experience should be captured that is noteworthy and encompassing. 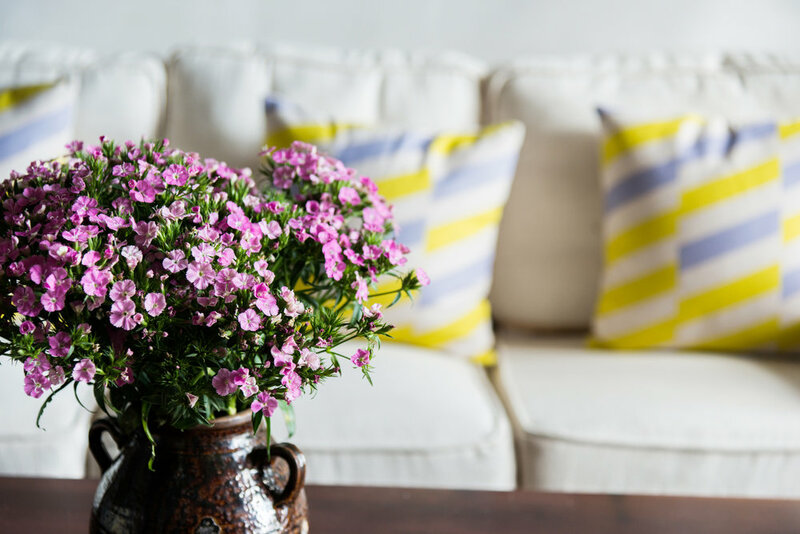 Adding color can be sumptuously and irresistibly achieved with throw pillows, draperies, art work, artifacts, window trim and painted accent walls. Need more be said? Historic highway 30A is more than just a chronicled county road in Florida. It is an experience and just happens to be our home base. This two lane road parallels the Gulf of Mexico and leads to an escapade of beautiful aqua-marine water and snowy white beaches filled with soft sand that sinks in-between one’s toes. Some declare it to be the most beautiful fifteen mile journey of beach and sand dunes just about anywhere around. It is unparalleled and indefinable. The 30A route would be devoid of interest and attraction without the color of the water, the sand, the dunes, the fresh water lakes and the unforgettable sunsets. Design just like nature: Add Color! Design choices such as a simple old-fashioned white porch swing, a teal bench situated against a tangerine accent wall, white shiplap siding with hooks for beach towels, a red and blue farmhouse bedroom, fresh pink flowers on a table, a teal, navy and aquamarine headboard in stripes and polka dots and sheer curtains blowing with the opened window, give credence to the ultimate easy going vibe of life at the ocean: beautiful, yet comfortable; classy, yet casual and of course, consistently colorful. Design Thought: Make certain that the aesthetics of the swing coordinate with the architecture of the house and porch. There are various styles to choose from: cottage, arts and crafts, classic, modern, custom designs and more. Colors are limitless. Design Thought: Purchase a used or inexpensive headboard, preferably a rectangle. Mix and match approximately six fabrics in three colors each of polka dots and stripes. Design a pattern similar to patch quilt blocks and have headboard upholstered. Remember, the plusher the batting underneath the fabric, the more cushioned the headboard. Design Thought: Studies demonstrate that it is very significant to occupants within their home to have a view of the outside with adequate windows. It is preferable that the view be of greenery and/or nature. Daylighting makes people feel better and markedly improves their health. 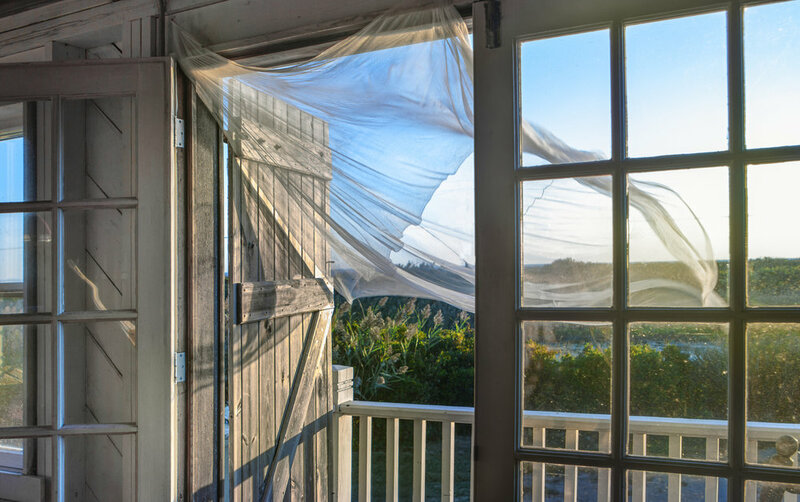 Draperies and window treatments should be tailored around the importance of daylighting. Design Thought: Shiplap can run vertically or horizontally. It creates texture and adds warmth to a room or whole house. If budget is a factor only apply shiplap to high ceilings to create a sense of intimacy or choose to accentuate an architectural feature in a certain location of the home. Design Thought: In decorating bedrooms start with a bed skirt, then layer on sheets and a blanket, tucked in together. Mix and match various patterns and colors. Lay a folded duvet across the end of the bed. At the head of the bed pile on the Euro shams and throw pillows in front of the sleeping pillows. 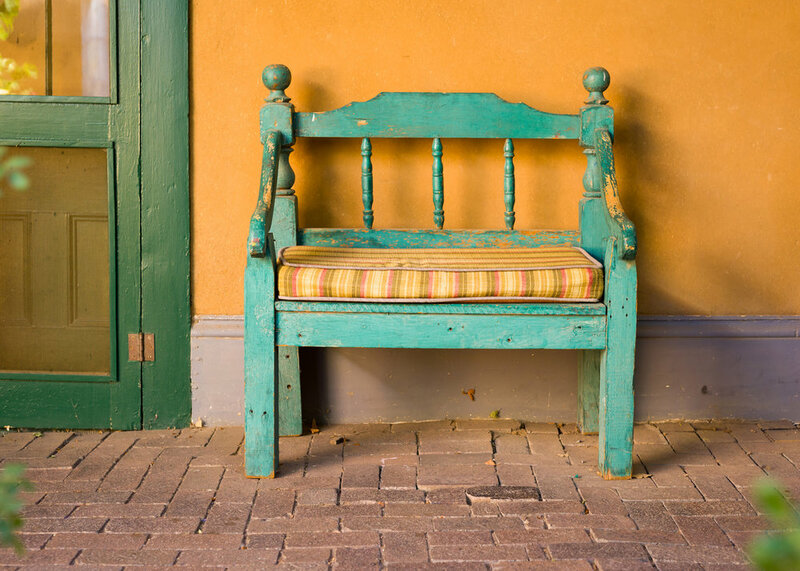 Design Thought: Bring that teal bench that you love so much inside to the mudroom or hallway of your beach house. Reupholster the seat cushion with a new teal patterned fabric, accented with the same tangerine color that is on the porch wall. To highlight your coastal piece, select a color from the chart below, such as taupe or brown, to paint an interior accent wall where the bench will be placed. It becomes "pIcture perfect" just like the sand greeting the ocean. 1 Wilde, Oscar, GoodReads. https://www.goodreads.com/quotes/245642-mere-color-unspoiled-by-meaning-and-unallied-with-deﬁnite-form Web. 10, May. 2017.